I’d been looking forward to my night in the Briar’s B&B in Caldbeck, mainly as it would be the only night on the trip I wouldn’t have to share a room. No worrying about making too much noise in the morning; no sleepless nights caused by someone snoring. Plus you don’t have the slightly odd feeling you get sitting at a table eating breakfast by yourself whilst someone regularly comes along to give you more toast, a refill of coffee or a plate of bacon and eggs. I was the only person staying at the Briars, which made it feel doubly odd as I sat staring out of the window watching a number of birds swoop from the outside bushes onto a nearby birdfeeder. I also had the feeling of an adventure coming to the end. Today was the final day – a mere fifteen and a half mile walk to Carlisle. Later that very same day and Virgin Trains would be whisking me back to London for a nights sleep in my own bed. The days of casually wandering from one place to the next, before settling down to a pint and some food, were almost over. The Briars was actually on the Cumbria Way but I needed to head into the village centre to pick up some lunch anyway, and my guide book informed me that I really should see the Howk if I had some time to kill. A limestone gorge, it also contained the ruins of a bobbin mill on its banks, which had been reasonably well restored. 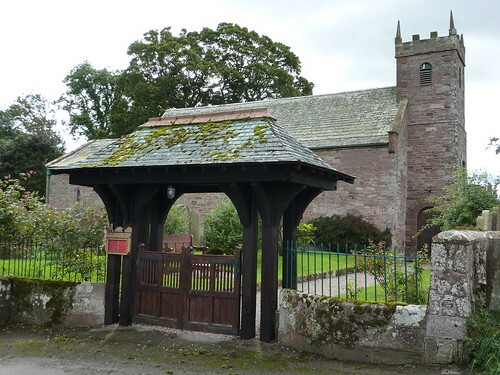 The weather had also cheered up a little, and I completed the easy half mile circuit round the Howk, and up to the post office, and then past the small church and back on to the Cumbria Way. Almost immediately came the first major change of the day. Caldbeck sits on the edge of the Lake District National Park, and leaving it meant I was back into “normal” land. 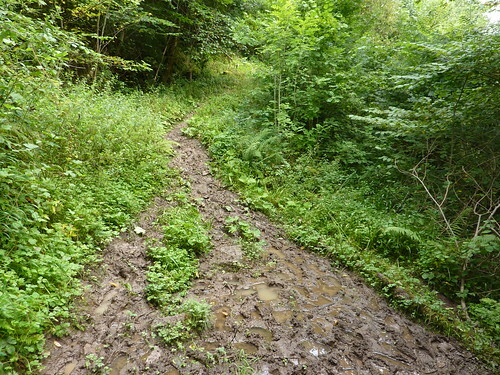 I’d been warned the woodland path might be a bit on the damp side, but the way was more mud than anything else, and very deep and slippy too. I muttered and grumbled as yet again my boots ended up completely covered in mud, and at least twice I came extremely close to ending up head first in it. As I walked past a sign boldly proclaiming that I should beware of falling rocks as I was in a landslide area, I muttered to myself that the sign should be warning me more about how easy it would be to slide down the hill and straight into Cald Beck instead. Hence why anyone watching would have seen the rather embarrassing sight of a man walking on relatively flat ground, using two walking poles to get him on his way. Well you know what they say, four legs good, two legs bad. Embarrassing it may have been, but the poles provided extra grip and ensured I didn’t wander round looking like I had applied some swanky beauty treatment to my face. Still, I was more than glad to finally get to the edge of the forest and on to some decent paths. For most of the remaining day it was pretty easy going. After passing by an attractive small church, it was a simple matter of strolling mostly along the River Caldew. The hills had long been left behind and the scenery was flat looking farmland containing sheep, sheep and more sheep. And the odd cow too. The Way was also relatively quiet. Clouds may have been still lingering but it was dry and warm, however this part of Cumbria was no longer regular walking territory. Bar a solitary couple I’d seen one and off since leaving the mud filled Dentonside Wood, I’d barely seen anyone. Whilst there may not have been anyone around, signs of population were increasing. Small deviations onto roads would take me past several houses, but arriving at Bridge End was still a shock to the system. 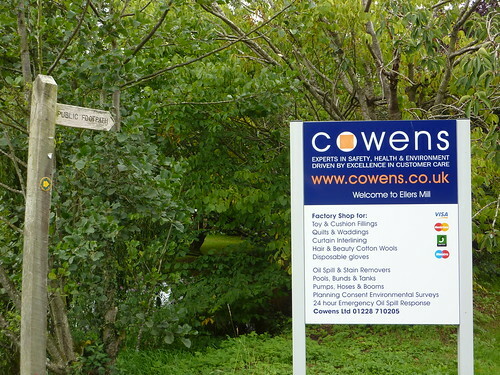 Abruptly arriving at a main road, I suddenly found myself on the edge of suburbia – rather unexpectedly I found myself in the Carlisle commuter belt, and felt rather wrong as the Cumbria Way took me past a factory shop offering me the chance to buy disposable gloves or cushion fillings. Even more strange was finding myself in the town of Dalston and as I walked through the green in the middle of the town, I suddenly found myself feeling rather self conscious. Here I was, togged up, looking like I was about to do battle with serious mountains, only to be walking past a bakery and a building society. 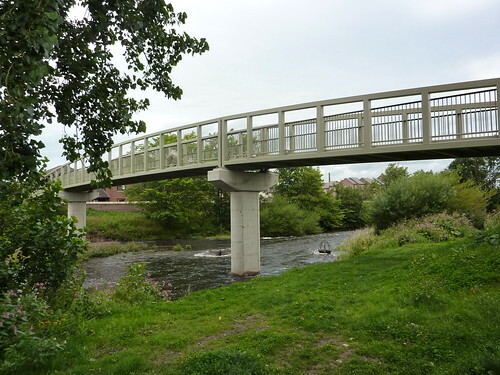 It felt even more wrong when I found what would be the final segment of the whole walk – the final six miles to Carlisle would see me feeling even more out of place as the Way took me along a tarmacked cycle path, alongside wasteland, factories and a train line. The whole ending seemed deeply unsatisfying. The views dull and uninteresting. Two trains did go past, livening it up for me, but I was rather glad to get off the cycle path when the Way crossed the River Caldew and took me on the other side. Unfortunately this proved to be not significantly better as I was now walking on a narrow path, fenced it at the edge of fields. With half a mile to go, this changed to a little strewn path near a housing estate before the finishing line finally drew into sight. Reading up after the event, Market Cross is acknowledged by many as the de facto end, however my guide book proclaimed it was at a footbridge when the path finally left the river and who was I to argue? Given I hadn’t even seen a Cumbria Way way mark since I’d arrived in Dalston, I wasn’t holding out much hope for any celebration at the end of the walk. And I was right too. Carlisle City Council clearly had no intention of even acknowledging the Way existed even when it was on a relatively nice bit, yet alone at the end. There wasn’t even a sign at the end, yet alone an obelisk like that erected by the good folk of Ulverston. All there was was the footbridge and I dutifully marched up the steps, and found out standing outside the municipal bin lorry depot and opposite a council recycling centre. It all seemed a rather anti-climatic way to finish a 73 mile, 5 day jike, although given most of the afternoon had built me up to this complete non-ending, it seemed not entirely surprising. Sighing, I headed into town to see the sights. I don’t know about you, but I can’t think of a better sausage to finish off five days of Cumbrian walking than a good old fashioned bratwurst washed down with a pint of Okocim polish lager, so I was glad that I had these options available to me in the market square. The only way that could be made better would be if I could somehow finish my Okocim and move somewhere else to get a pint of Munich’s finest Paulanaler, whilst eating a Turkish doughnut thing, sitting on some bizarrely shaped wooden furniture whilst admiring potted plants and listening to some native American singers regale me with tunes. So I was more than grateful to find all those options available to me in Carlisle’s compact market square. Frankly I don’t know what I would have done otherwise. 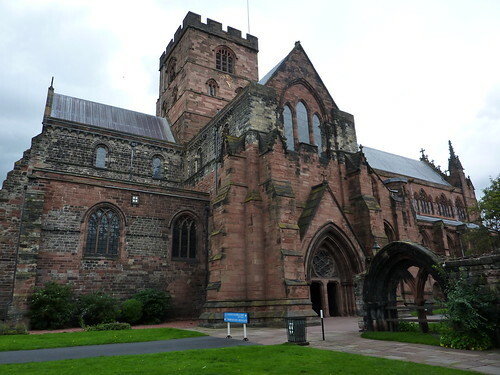 Stuffing a bratwurst into my mouth and swigging lager like there was no tomorrow I headed for a period of quiet contemplation sitting outside Carlisle’s beautiful cathedral – it seemed a more fitting an end than the bin lorry depot. It was all over. The end. The final mile had been walked. All I had to do now was take off my boots and work out what to do in the three and a half hours before I could use my train ticket. Just a quick note to say how much I enjoyed this series. Wish I had the time and the body to be able to do something like this. Shame Carlisle was such a let down!! Thanks for the trip report. Really enjoyed it and brought back some good memories of my trip last year. We walked in the opposite direction (in a gale unfortunately – we walked into it!) which, after two previous aborted Northbound efforts, was a really satisfying experience. Carslise does strike me as being a bit of a pants finish – although I think the official finish is now the castle. I’m sure the Ulverston-Coniston section must have an automatic “rain” function whenever a walker attempts it! We took the lower route as well from Caldbeck, and yes – we did get lost! Some of the waymarking is abysmal over the route. I’ve had a few discussions with my other half about the Cumbria Way (Catherine has only done bits of it) and to be honest suspect the answer is simply to start at Carlisle and walk the Ulverston as you did! Thus solving the problem of a lacklustre finish. The castle would certainly make a better finish but for me it was the whole final stretch that was disappointing. A couple of miles down an urban cycle path just don’t inspire much. Carlisle is much better than you make it sound! It must have been a special European goods market day to enable you to swig Polish lager and eat Bratwurst… what is wrong with good old Cumbrian sausage and a lager and lime? 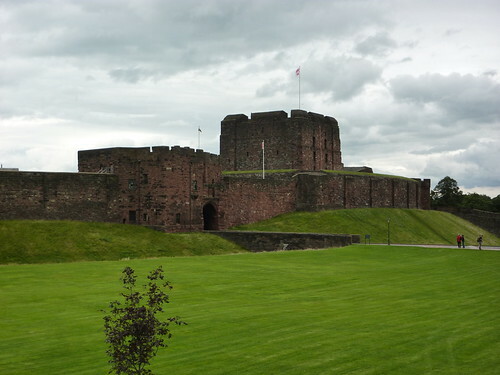 I love Carlisle, well I would seeing as how I lived there until 1968 and now go back every year to visit family and friends. It is a lovely little city and deserves more than you wrote about it. Ah well I’m afraid I didn’t see much more than the bin lorry depot! It does look a nice city – I remember visiting it with my Grandad when I was about 13 and it was a great day out. Although part of that was because we also went on the Settle to Carlisle line! Absolutely enjoyed reading this account of your walk – I was laughing all the way through as it brought back memories of all those traits of staying in shared hostel dorm rooms plus the accounts of the mud and slippery paths – yes, we have walked quite a lot of those too and we use walking poles to steady ourselves although now in our sixties, feel we can be excused! We still use YHA’s on our travels, although try to book 2 bed rooms even if they have bunks; I quite like the top bunk but as you point out, making it up isn’t easy especially trying to fit that bottom sheet on which seems to have shrunk. I have been told that at all hostels now the beds/bunks should be made up for guests and certainly the thought of struggling with fitting a duvet on is not an entertaining one! We have walked the entire South West Coast Path using a mixture of B and B’s, hostels, guest houses. 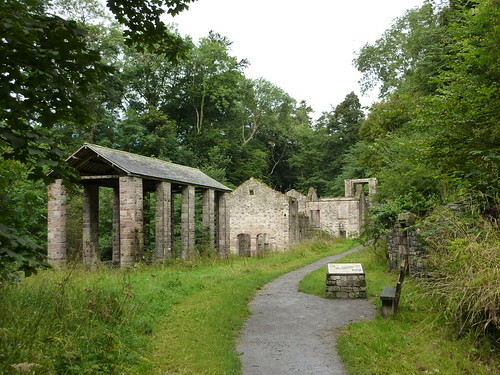 Our first “long” walk was the Herriott’s Way, sadly two of the hostels in the circular walk have since closed. We also belong to our local YHA group and along with our Bedford Group members, combine together for walking weekends and longer. Currently husband and I are doing sections of the All England Coast Path as new bits are opened and also the Wales Path, having just returned from Cardiff and made good use of the trains to do linear coastal walking. We have almost finished the Nene Way, just one 6 mile section remaining because the embankment needs to stabilise and later this month will finish the Jurassic Way, (not to be confused with the Jurassic Coast). Other adventures on the horizon are the Coast to Coast and the West Highland Way, hopefully before we get too decrepid and the kness/hips wear out! Happy walking and thanks again for writing such an entertaining read. The road from Sebergham bridge towards the site of Bell bridge is now open to walkers but not traffic. We are sorry that has been closed for so long. As we live on the waterside we find it interesting to meet walkers from many different countries. I can see Skiddaw House from here! Honest! First Published: 25 September 2009. Last Updated: 16 November 2014.